Marikina City has been known for its progressive shoe industry. 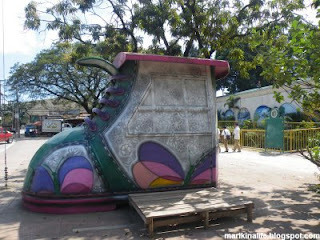 And Marikina showcases the shoes in many forms. For example, along Marikina River around Bayan, you'll see some giant shoes floating at the middle and lighted up in the evenings. You may encounter a motorized high heel cruising the streets. And then there's the ShoeStore. Nope we're not talking about actual shoes being sold. Instead, the entire store is situated inside a big shoe. 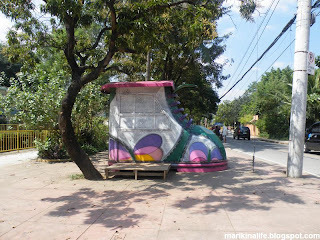 Some sari-sari stores along the stretch of Champagnat Ave. in front of the World of Butterflies going to the Marikina Heights National High School are designed as giant shoes, whose sides can be opened to cater to customers. Think of a Burger Machine mobile stand but inside a shoe instead of steel housing. These colorful shoes in Marikina Heights are another project of the city of Marikina created to cater to showcase Marikina's flourishing shoe industry.